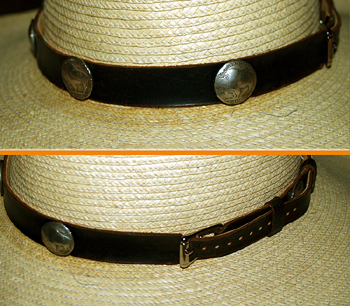 Select from two new Longhorn Hatters Hatbands. Shown here are two selections: Longhorn with rope braid outline concho, and Longhorn oval shaped concho. Each band is one inch custom cut brown leather with backing with seven silver Longhorn conchos. Bands are adjustable to all hat sizes from back of band with leather lacing. When ordering, denote which band suits your fancy. 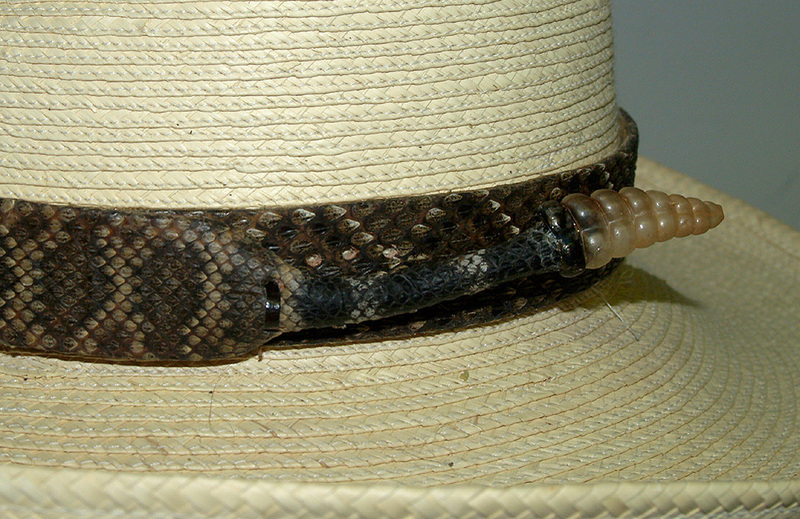 A WORD OF CAUTION: ALL OF LONGHORN HATTERS RATTLESNAKE HATBANDS FIT WELL ON FELT AND STRAW HATS DUE TO THE CONSTRUCTION OF THE HAT BODIES USED.. 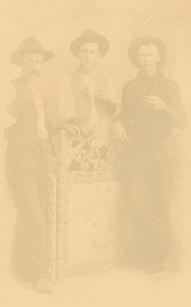 IT WOULD BE ADVISABLE BEFORE PURCHASING A RATTLENAKE HATBAND TO CONTACT LONGHORN HATTERS IF THE BAND IS GOING TO BE PUT ON A LEATHER HAT BECAUSE OF FITTING PROBLEMS WITH THE CONSTRUCTION A LEATHER HAT. 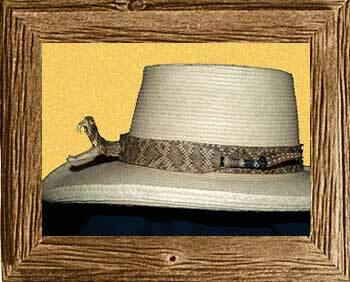 This band is fully adjustable to fit all sizes with rattle mounted on left side of the hat. 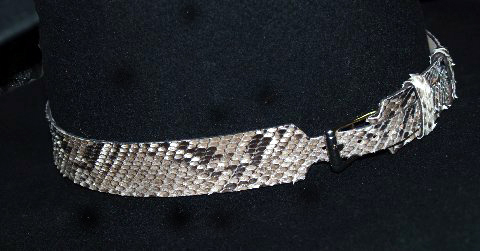 The band is 1" wide with pig skin backing. Outstanding marking. The band is 1" wide with pig skin backing. It is mounted to show trail hardships with wrinkles around the tail section. The hatband is fully adjustable. Adjustable to all sizes. The band is 1" wide with pig skin backing. 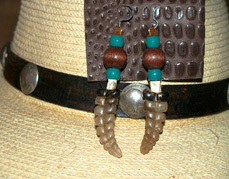 Shown, is a picture of a pair of Western Diamondback Rattlesnake Ear Rings. 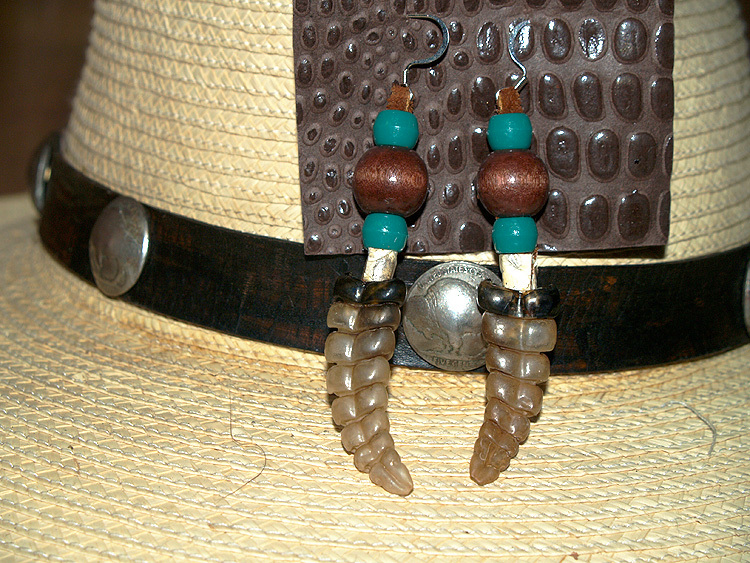 Mounted on Sterling Silver Pierced Ear Ring Studs, and accented with turquoise color, and dark brown wooden beads with snippets of Rattlesnake Skin, this set is a MUST for Cowgirls at any Rodeo or Honky Tonk Dance Hall. Definitely a Texas Conversation Piece!!!. Great patterns: one strand, two strand, round pattern. all equipped with two tassles. Black strip leather with seven silver star conchos. Silver Buckle adjustment is set for all sizes. Seven highly polished Buffalo Nickels, mounted on 3/4" strap leather. Pigskin backing. All bands are adjustable with Nickel Silver Buckle set up to fit all sizes. Same as the the Buffalo Nickel hatband with the exception of being mounted on 1" strap leather. Beautiful white, grey, and black patterns make this the top of the line. A great addition to your hat no matter what color. Adjustable to fit all hats with Silver Buckle set for all sizes. When measuring for a belt, add twelve inches to actual size. example: if you wear an actual belt size of 36” the belt should be made for 48” allowing six inches for snaps, etc. to attach belt buckle. 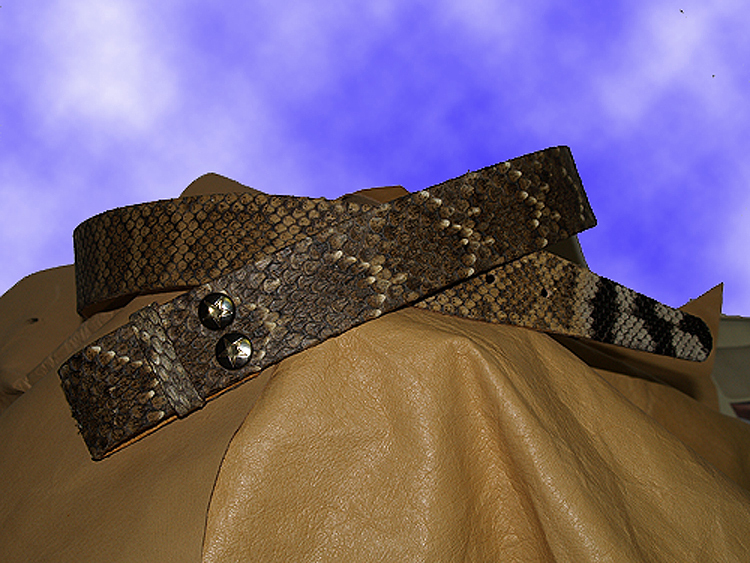 belt fits both kinds of buckles, tongued and one piece. allow two to three weeks for delivery as each belt is made on an order to order basis, and skin availability.